Autumnal Aromas in the Home - Amphora Aromatics Ltd – Supplier of pure essential oils and aromatherapy Products. Now that the colder weather and shorter days are drawing in, this time of year is the perfect time to create a warm and comforting environment at home. Simple things such as lighting some candles, snuggling up with your duvet and enjoying a warm drink or playing some music can really change the mood and create a cosy and inviting living space to lift spirits and make Autumn a more enjoyable experience. One of the most effective ways we can do this through the use of home aromas. The power of smell should never be underestimated and it is well known throughout history how particular fragrances can evoke strong emotional reactions. The beautiful floral aromas of oils such as Lavender can help induce deep relaxation (you can almost picture the rolling lavender fields on a warm summer’s day). The bright and cheerful aromas of the citrus oils such as Orange can really lift spirits and promote feelings of happiness and joy. Inhale the beautifully sweet aroma and picture yourself walking through a beautiful citrus orchard in the south of Spain. We can really use this to our advantage and make the most of ‘happy’ scents or aromas we may associate with good memories on a personal level. A certain scent may remind us of a holiday or of a special person. The olfactory system (the part of the brain which receives information about odours) has an incredibly intimate relationship with the areas of the brain that deal with emotion. This is why aroma can have such a profound effect on our mood, our memory and our emotional wellbeing. 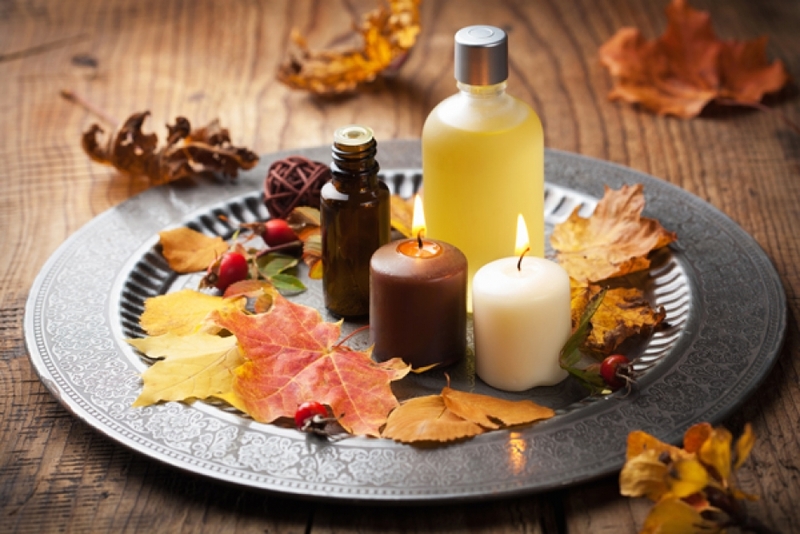 Here’s a few tips on how to use warming and seasonal scents to align our mood and senses with our environment and help promote feelings of warmth and security. A simple yet effective way to fragrance your home is using scented candles. Lighting a candle on a cold, dark winters evening can be a lovely way to create a warm and cosy atmosphere in the home. Here at Amphora we’ve recently relaunched our new range of all-natural aromatherapy candles made from essential oils and sustainably sourced plant wax. Beautifully presented, they make the perfect gift as well as a great addition to your own home. Cinnamon – stimulating and energizing. The perfect scent to warm the senses. Limeleaf and Ginger – zesty and spicy; a unique combination of energizing scents. Juniper and Pine – fresh and fragrant; to help revive and restore. Bergamot – sweet and fruity to help lift spirits during the dark evenings. Orange and Clove – sweet and spicy; to get you in the festive mood. One of the most convenient ways to scent your home safely (no naked flames to worry about). Natural aroma reed diffusers are becoming an ever more popular way of filling your home with your favourite scents. Long-lasting and subtly fragrant, our natural reed diffusers absorb essential oil blends through natural reeds, creating a gorgeous ambience. And, because they don’t require a candle or plug in, they are safe to use and leave unattended (an ideal option for students living in halls). We have a great selection here at Amphora; all of which contain a gorgeous blend of natural essential oils to help lift your spirits and make your home smell wonderful. Chose from scents such as calming Lavender, energizing Basil, Bay and Lime or refreshing Citrus Tonic. For the more traditional option, you can enjoy the great benefits of essential oils by diffusing them through either a candle lit burner or an electric fragrancer. Simply add water and a few drops of essential oil to the bowl, light the candle and enjoy the aromas as they are slowly released (but make sure you never leave it unattended). It’s a great way to get creative with different blends and you can tailor the aroma to suit your mood. Relaxing blend – 3 drops Lavender 2 Sandalwood Amyris and 1 Ylang Ylang. Here are just a few ideas of how to make the most of fragrance in your home. Thank you for taking the time to read this and we hope you’ll stay tuned for more free tips and advice from the Amphora team.